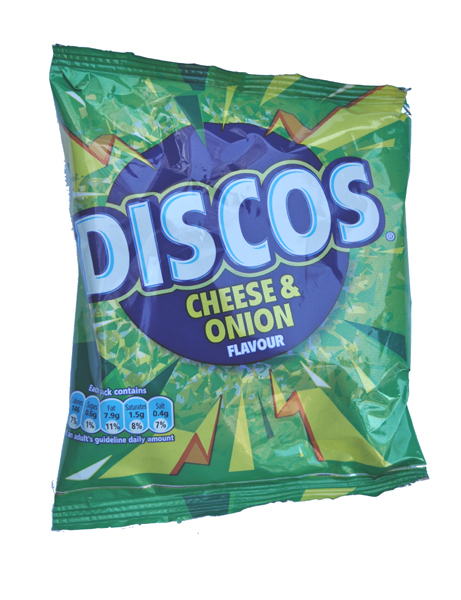 There is a lot going on with the Discos bag design. There is a blue circle in the middle, which is a little odd: Why blue? Why plain and without shading? Anyway, the circle is surrounded by shattering imagery. This looks effective, but is somewhat disconnected from the blue circle, from which it is apparently shattering from. Yes, odd. The bags are flavour colour coded. The wording is large and identifiable in the centre. There is no brand name, but as KP have been absorbed into Intersnack, perhaps they were not sure which logo to include. This is a shame because KP Discos trips off the tongue well, even if "Discos" is a little 1970s sounding. The crunch was dry and firm, with the snack breaking rather than cracking and splintering as Crisps do. The sound of the crunch was muffled, almost as if it were coming from inside a container. These snacks are very easy to describe. They were circular in shape. They were mostly gently bent, so not completely flat. The surface was bumpy but smooth. The colour was a very pale yellow that only with the closest comparison and scrutiny would a difference be found between these and the Salt & Vinegar version of this reconstituted snack product. A Nose Plunge Test revealed a resounding yes, to the question: Did they smell of Cheese & Onion? Admittedly it was not strong, but we could identify and separate the aromas. Unfortunately, the taste was not quite as impressive. The Cheese flavouring was evident, and it was also quite a strong Cheddar variety, but the Onion was not as readily apparent.